The preBötzinger complex (pBC), a region of the ventrolateral medulla, is critically important in the generation of respiratory rhythm . Slice preparations containing the pBC produce rhythmic, fictive inspiratory activity in the absence of stimuli due to autorhythmic and state-dependent bursting neurons that play an unknown role in pattern formation in vivo. Respiratory rhythm is a dynamic process, modulated by input from sensory feedback, neural inputs, extracellular milieu and background excitability to the pBC pattern generator. We used the NEURON simulation environment to investigate modulators of excitability and their effects on inspiratory burst characteristics. Previous network models of the pBC have focused primarily on intracellular properties and synaptic connections; in this model we have added a background tonic drive component and more complex potassium dynamics to examine neural excitability and provide mechanistic insight into the variability we see in vitro. A network of 100 heterogeneous synaptically connected inspiratory cells based on an earlier inspiratory single-cell model  was created with twenty percent of cells assigned a conductance profile that allowed intrinsic bursting. A recently characterized low-threshold, non-inactivating (A-type) potassium current  was added. 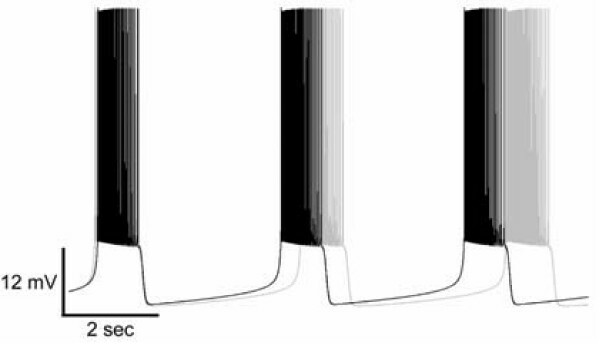 Shown in Figure 1, addition of the A-type current decreased baseline excitability, thereby decreasing frequency but did not change intra-burst behavior. A population of tonic-firing cells was created to produce output trains of Poisson-distributed presynaptic stimuli to inspiratory cells. The addition of background tonic stimulation is shown in Figure 2 where the addition of Poisson inputs has a direct impact on the variability of burst initiation and termination. 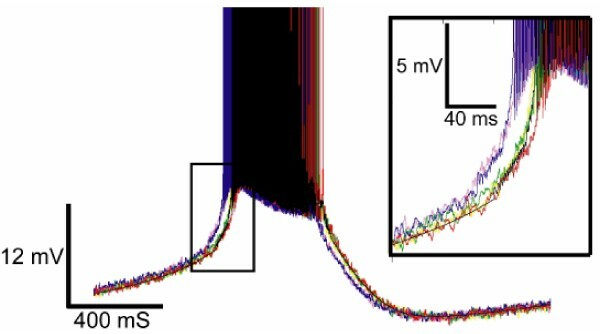 A second modulator of excitability was added via extracellular potassium dynamics. In vitro, extracellular [K+] is commonly used to modulate neural excitability; to better model the effects of this pertubation, a Frankenhauser-Huxley space, a Na+/K+ pump and glial buffering system were added to the individual cells. Raising the extracellular bath concentration of potassium ions depolarize cells and positively shifts the potassium reversal potential, this leads to an increase in network excitability which drives a transition from quiescence, to bursting, to disorganized, aperiodic activity. Raising extracellular [K+] caused a predictable, sequential change in periodic burst behavior whereas modulating background tonic inputs was less selective, causing a direct transition from bursting to aperiodic network activity. These simulations suggest that both tonic background inputs and local potassium dynamics play roles in determining network complexity and modulation of pBC rhythm. Impact of A-type current. Inspiratory cell bursting with A-type current (gray trace) and without A-type potassium current. Impact of tonic cell drive. Six trials of the same inspiratory cell with Poisson tonic input drive (colored traces) and without (black trace).